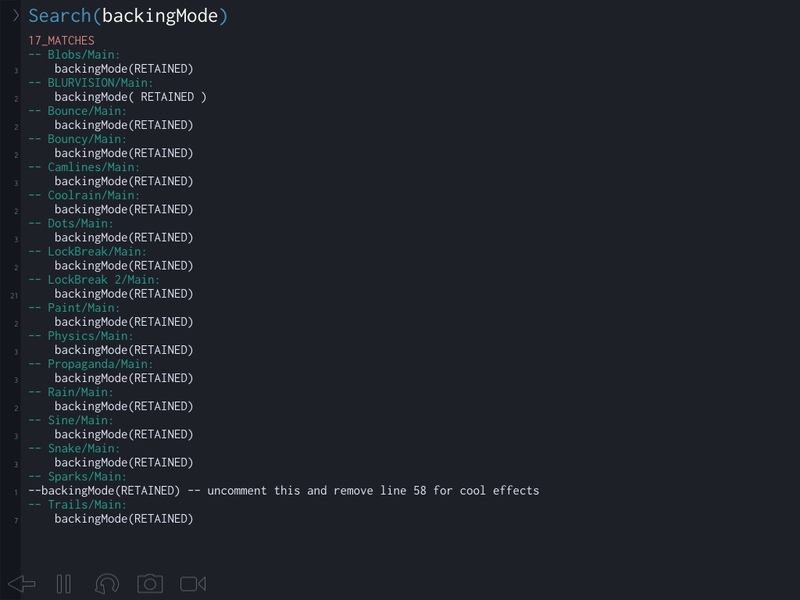 Since I couldn't find a way to search for something in all my Codea projects at the same time, I made one myself! I even tried to replicate Codea's style so you feel right at home when using it! local title = "-- " .. match.project .. "/" .. match.tab .. ":"
@MPan1 Here's a link to a program I wrote back in March 2013 that searches all projects. You had to create a table of projects manually because listProject wasn't implemented yet. I eventually used a plist file to get the list of projects. You can see that I asked for that function to be added. I updated my program since then to use listProjects and made other improvements to it. One thing that can be done is to select a project from the matched list to view all the code of that project and then return back to the matched list to select another project to view. I have over 500 projects, so that's why I created it back then. EDIT: Yours doesn't appear to use listProjects since that wasn't around when you made it. Mine does though.